PONCA CITY, Okla. — On quiet days, which they all are now, retired high school music teacher Robert Moore likes to pore over the list: The names of all 900 of his former students. He spent 30 years directing one of the greatest high school choral groups in the country — the Ponca City Chorale of Ponca City, Oklahoma. “Wouldn’t it be great to get those kids back together,” he said. Unbeknownst to Mr. Moore, a small group of students have been plotting a surprise for the past year. They lured him out to the country, and then hit him with the greatest gift a teacher can receive. Former students surprised Robert Moore. From across America and three foreign countries, Robert Moore’s former students returned, nearly 300 of them, all to tell him the huge difference he made in their lives. Many went into education. Many more pursued music, including John Atkins, who graduated in 1976. “I had a 25 year career singing with the LA Opera and all around the country and it wouldn’t have happened without you,” John said. Robert Moore’s former students performed for him at the Poncan Theatre. To repay their debt of gratitude, the students rented out the old Poncan Theatre and put on one last show for their mentor. Their harmonic voices, and their cumulative success, are no doubt a testament to what a good teacher can accomplish in a career. I say good teacher, which is different from a likable teacher. 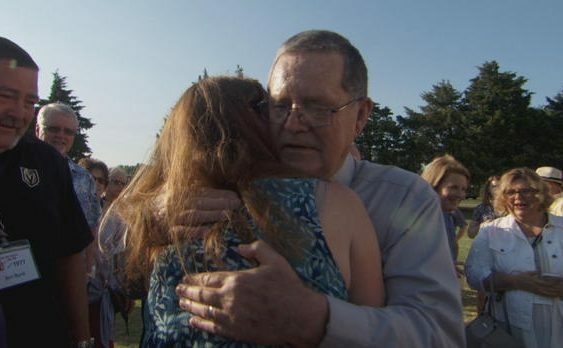 Former students said “discipline was huge,” and Mr. Moore was “not warm and fuzzy.” But they said they would do anything they could to please him, and on that night, they did just that. Tough teachers often go unappreciated for years. But if they’re good, eventually the thanks do come thundering — giving the teacher an opportunity, at last, to show his students how he felt all along.